Even 17 years later, Tom Brady still has a chip on his shoulder. Everyone knows that Tom Brady didn't exactly set the world on fire with his performance at the 2000 NFL Combine. For one, Brady was slow as molasses, running a 5.28 40-Yard Dash. Chad Clifton, a 334-pound tackle, ran a 5.05 that same year. Brady also showed a lack of explosiveness; his 24.5-inch Vertical ranked last for his position and third-worst of any player. His 99-inch Broad Jump was also bad, worst among QBs. The footage of him at the 2000 Combine is amazing to watch in retrospect because of how little he looks like a future NFL starterâlet alone a guy who could go down as the greatest quarterback in football history. For one, Brady was slow as molasses, running a 5.28 40-Yard Dash. Chad Clifton, a 334-pound tackle, ran a 5.05 that same year. Brady also showed a lack of explosiveness; his 24.5-inch Vertical ranked last for his position and third-worst of any player. His 99-inch Broad Jump was also bad, worst among QBs. 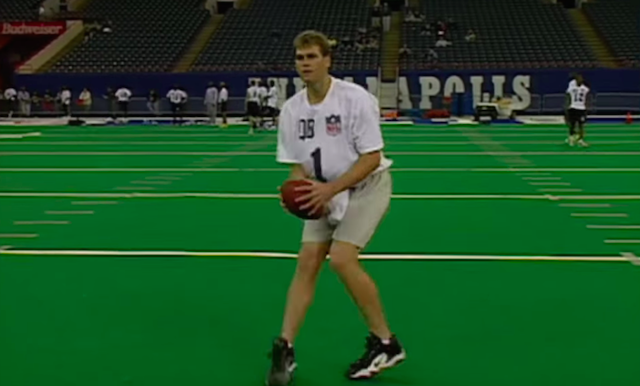 The footage of him at the 2000 Combine is amazing to watch in retrospect because of how little he looks like a future NFL starter—let alone a guy who could go down as the greatest quarterback in football history. "I found my combine shirt from 17 years ago and it got me thinking. This is what they said about me then…Poor build, Skinny, Lacks great physical stature and strength, Lacks mobility and ability to avoid the rush, Lacks a really strong arm, Can't drive the ball downfield, Does not throw a really tight spiral, System-type player who can get exposed if forced to ad lib, Gets knocked down easily. As @edelman11 (Patriots WR Julian Edelman) always reminds me…'You can prove em right or you can prove em wrong!' Good look to all of you this week! !," Brady writes in the caption. And yes, he somehow still has that bed sheet of a t-shirt in his possession (it looks like those might be the same shorts, too). Seventeen years, five Super Bowl rings and two MVP trophies later, it's safe to say that Brady proved the doubters wrong. He wasn't the first player to outplay his scouting report, and he certainly won't be the last. For what it's worth, Brady recently said that he'd "crush" his 2000 Combine results if he ran through the drills again today. Does Tom Brady's Focus on Muscle Pliability Actually Work?